If you’re looking for eye doctors for dizziness while reading, bookmark this page as your primary reference. With a degree in Doctor of Optometry, Dr. Erin Sonneberg graduated from the prestigious New England School of Optometry in Boston, Massachusetts in 2004. After two years, she moved to Boynton Beach, FL, and practiced alongside some of the most sought-after ophthalmologists in the area. Her passion to help others achieve better visual health motivated her to open her own clinic, the iSee VisionCare, in 2015. In 2016, Dr. Sonneberg realized that becoming one of the eye doctors for pain with eye movement and other binocular vision disorders (BVD), a neurovisual optometrist, is her ultimate dream. She traveled to Michigan to receive intensive training from the country’s foremost expert in this field, Dr. Debby Feinberg of Vision Specialists of Michigan. Currently, Dr. Sonneberg is one of the eight certified neurovisual optometry specialists in the country and the only one in Florida. NeuroVisual Specialists of Florida and iSee VisionCare is committed to giving you the highest standard of optometry care while maintaining a nurturing and calm environment. Dr. Sonneberg has the necessary knowledge, training, and skills when it comes to neurovisual optometry. 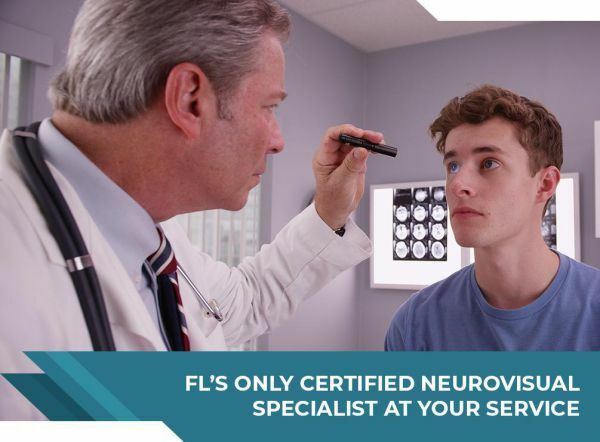 As Florida’s only certified neurovisual specialist for treating BVDs, we provide reliable remedies for patients who suffer from double vision, headaches, and dizziness. Apart from being eye doctors for headaches while reading, we also offer comprehensive eye exams, contact lens fittings, and eye care options to improve your visual acuity. We manage cataracts, dry eye syndrome, and macular degeneration as well. We also have a wide selection of high-quality eyewear and we can help you find the best pair to suit your needs and preferences. To learn more about us and our services, you can reach us at (561) 733-9008. We proudly serve residents in Boynton Beach and the surrounding FL communities.